Here's a little snippet from an article titled the "Ultimate Hockey Parent Guide" that ran in the August 2018 issue of USA Hockey Magazine. It was written by Christie Casciano Burns, who often pens the Hockey Mom column in USA Hockey Magazine. For people outside of youth hockey, AAA is the number you call when your car breaks down. AA puts you on a 12-step program to sobriety. A is the grade you want on your child's report card. But those letters have a whole different meaning to hockey parents. The intensity of AAA hockey can build players and families, but it can also break them if they're not careful. That's why it's important to have realistic expectations when it comes to elite travel teams. Constantly chasing the opportunities by trying to "play up" at the highest level can sometimes hinder a player's development if he or she doesn't get enough ice time or opportunities. "Honestly, it doesn't make a particle of difference until Midgets," says Alaska hockey mom Diane Firmani. "At younger levels, it's merely bragging rights for parents and instant martyrdom." As you might expect, this touches a nerve with me. I will openly admit that I almost always disagree with the stance she takes in her columns but on this small snippet, I agree, whole-heartedly...well, until the final quote is thrown in. The Alaska hockey mom's statement, "It doesn't make a particle of difference until Midgets" is kind of ignorant, in my opinion. I mean, look, if your son or daughter is having a great time playing rec level hockey on the weekends, you're in the right place already. There is absolutely no need to look in to or consider AA or AAA hockey. Elite hockey probably isn't for you, anyway. And that's not a slight on your son or daughter's talent at all. I've found that most families in that setting, doing the weekends only from October to February thing, while still having the exact same unrealistic NHL dreams as *every* other hockey parent, elite or otherwise, are blind to the fact that Tier 1 teams even exist. They're the sorts that have the "they'll find you if you're good enough" myth engrained. But if your son or daughter really seems to love playing the game, regardless of their current talent level, then maybe, just maybe, you should spend some time deciphering the "Alphabet Soup" to supply them with more of what they love...but way, way, WAY before Midgets (age 15). The way Diane Firmani's quote is placed in article gives it context that may or may not have been her intention or what she was actually trying to say. I'm sure it's just a small piece of what she actually said in full and it probably is out of context, though who am I to say? "It doesn't make a particle of difference until Midgets." I can't be totally certain what "it" is referring to here, but if it's the level of hockey (like the article implies), she's way off base. Stats do not matter until Midgets. But if you're not already in AAA program long before Midgets, you're not going to be properly prepared to play at a AAA level as a Midget. It's kind of like saying academic performance in school doesn't really matter until high school. Universities don't care how great of a student you were in 5th grade just as elite Midget programs don't care how great you were as a Squirt. But can a poor student suddenly "turn it on" in high school? I mean, I've never seen it happen. Ever. Hockey is the same -- good habits, gained early, stay with you all the way through the journey. You don't just wake up one morning as Wayne Gretzky or as Valedictorian. That kind of success, athletic or academic, takes years of work and dedication. "At younger levels, it's merely bragging rights for parents and instant martyrdom." Okay, yes, for some parents, this is true. There will always be parents that go out of their way to talk about how their son or daughter plays on some exclusive Tier 1 AAA Premier summer tournament Selects team. Normally, I'm not a fan of braggarts or really anyone who's super arrogant about their achievements. It's annoying, right? I mean, everyone has that one co-worker whose kids seemingly can do no wrong and are awesome at everything... I roll my eyes too. But at the same time, you almost have to smile that they're so darn proud of their kids. Do I think my sons, who play AAA hockey, are better hockey players than the kids that don't? And here's why... My two oldest, (ages 7 and 9) just recently competed in a summer "rec" league with kids between the ages of 6 and 10. Over the 10 game season, in which my kids only played in 8 of the games, they combined for 73% of their team's offense. Two players scoring 73% of the points...while missing games. Further, their offensive output made up 31% of the scoring for the ENTIRE league. Not to brag or anything (ha-ha) but Duncan's league leading scoring total was three times that of the next closest player...and he played in two fewer games. So, yeah, I think my kids are better than the typical player at their age level and I attribute that entirely to playing AAA hockey cause they weren't always this good. Oh, and the kid that finished second behind him in scoring...also a AAA hockey player. 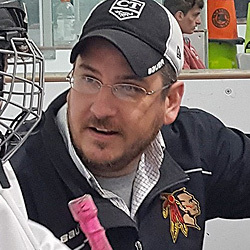 Circling back around, the AAA players at the Mite and Squirt level will undoubtedly be prepared and ready to play at the AAA Midget level if they choose to. Do I consider myself a martyr for all of the time spent each week shuttling them all over the place? No way. Not for a second. People rib me all the time for "always" being at a rink somewhere here or there, hundreds of miles from home. It's like it's a joke or some sort of torture or something but you know what? I love it. Christine says that "AAA hockey can build players and families" and she's right. Time at the rink for practices, the idle time before or between games, and time spent in hotel lobbies is all time spent with my kids' friends whose parents are my friends too. I'm not a martyr. There's isn't an ounce of suffering. I enjoy arriving 90 minutes prior to every game. I'm filling my free time surrounded by a few dozen friends...and we all get to include our kids too. Oh, and while I said up top that I rarely agree with the stance Christie Casciano Burns takes in her monthly Hockey Mom columns, I must say that her "Puck Hog" book should be standard reading for every single mite and squirt hockey player - especially the stand out players that make it all not-so-fun for everyone else. I mean, on those, she nailed it. Not surprisingly, AAA programs coach the exact same thing she's subtly teaching kids in those books. » Snobbery in Youth Hockey? » After 3 years of solid hockey...it happened. Burnout.